Here comes the issue: how to merge MP4 files without re coding and changing video quality? Usually you can choose to join MP4 files online or via MP4 merger. This article will guide you to combine multiple MP4 files in both ways. To help you combine several MP4 videos into one without changing quality, a awesome MP4 video merger is in demand. MacX Video Converter Pro (windows version) is the target MP4 video merger which can join multiple MP4 files into a single one, regardless of the resolution, codec, aspect ratio, frame rate, bit rate or audio. Actually, besides MP4, it also supports to combine AVI, MOV, VOB, FLV, M4V, MPG, 3GP, 3G2, F4V, MPEG, TS, M2TS, MTS, WMV, MKV, ASF, MOD, virtually any formats together. Still, the multifunctional MP4 joiner also works proficient in splitting, trimming, cropping videos and adding watermark/subtitles to videos, downloading MP4 videos and converting MP4 or any other videos. Step 1: Free download the MP4 merger on Windows or Mac version on Macbook Pro/Air, iMac etc. Then click "+ Video" to load separate MP4 files, or you can simply drag and drop to import MP4 files as well. 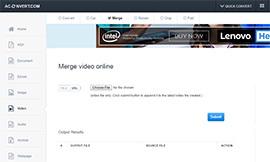 Step 2: Slide "Merge" button to "ON" to activate the MP4 video merger and continue. 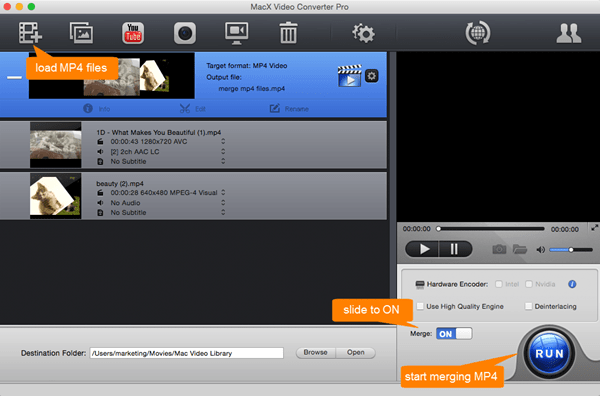 Step 3: Press "RUN" button to start joining MP4 files on Mac or Windows. Thanks to Multi-core, hyper-threading, Intel QSV tech, the MP4 merging will be finished in the twinkling of an eye. Besides, this MP4 joiner can also be used as a MP4 video splitter, downloader, editor, converter etc. Undoubtedly, MP4 video editing software does a great job on merging MP4 files. But it's not the only way, online MP4 mergers can do the task the same though it might not be so quick and safe. There are a number of online MP4 video editor you will get to use for free, such as AConvert, YouTube Editor, VideoToolbox etc. Each one has its virtues and faults on MP4 files combination. Cons: Sometimes online videos from YouTube, Facebook cannot be submitted. Pros: It is easy learning how to use this video editor; Its working speeds are very high and it does not cost anything. Cons: Only basic features are available with this editor so expect to experience some limitations. Pros: You will not pay anything for the program downloading and installation to your computer. Cons: There are some features that you will not be able to enjoy since it's on a free version. Step 1: Click "Choose File" to select MP4 file from local drive. Or paste your target online video URL to be merged. Step 2: Click "Submit" button to start processing. 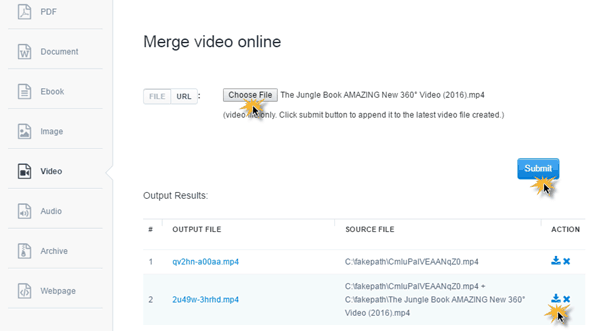 The video files you added to merge must have the same format, size and frame rate etc. 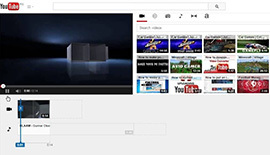 The new video file will be appended to the latest video file created. As you can see, combining MP4 files online requires a lot, especially the same format, frame rate etc. Actually, not all your MP4 files meet the criteria indeed for MP4 merging online. So to get a more flexible MP4 video joining, you are suggested to turn to third party MP4 video merger, which ensures a fast speed and safe merging process. MacX Video Converter Pro, the best MP4 video merger on Mac and Windows, enables you to merge/join/combine multiple MP4 video files into a single one without re coding and any quality loss. Super fast and 100% safe!